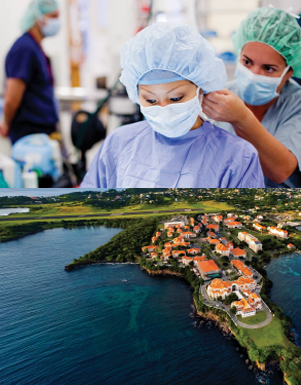 USMLE Step 1 first – time pass rate for SGU students – from 53 countries – in 2016. 1st year Medicine Programme in India at Ramaiah Campus followed by UK or Grenada. Clinicals in US or UK. Cost of Ramaiah program USD $ 15K. *According to an article in the Journal of Medical Regulation, A Census of Actively Licensed Physicians in the United States, 2016, Vol. 103. No 2. **Data as of April 2017. ***According to an article in the Journal of Medical Regulation, A Census of Actively Licensed Physicians in the United States, 2014, vol. 101 No 2. Wide range of furnished accommodation are available to suit the needs of the student community. Single or double room occupancy with a common Kitchen, living area and independent bathrooms with internet access. Accommodation is available within 2 Km distance from the campus. Transport is available to the campus. Cost includes electricity, water, Wifi and monthly maintenance. Canteen service can be provided on request.